Exotath features a deeply fullered 420J2 stainless steel blade (false edged), leather wrapped blade-grip, finely detailed cast metal hilt parts with "antique" finish, and a genuine leather wrapped grip. Each of the 1500 piece first production run are serial numbered, include a certificate of authenticity, and an art print by Kit Rae. 28 3/4" blade, 44 3/4" overall. "In the beginning of things in ages past there were the Ancient Ones, masters of flesh, fire, and steel, who forged the elements of which the world was made. When mortal men and beasts came into the world the Ancient Ones purposed to have dominion over them, hence they created the Swords of the Ancients. Forged of secret enchanted alloys, these weapons have been used throughout the ages in the eternal struggle between good and evil." The highly popular Swords of the Ancients collection, created in 1997, has become legendary the world over among collectible sword enthusiasts who want only the finest designs and highest quality. Each features tempered 420J2 blades, false edged, and highly detailed antique finished metal handle parts, all made to the designers exacting specifications. The Sword of the Dark Elf, Agnemmel, fierce war captain of the Dark One. Forged by Firaneth, the blade allowed Agnemmel to see into the future, giving him great advantage in battle. The latest in the Swords of the Ancientsâ„¢ collection! What a GREAT sword!! I love both my swords by Kit Rae from BUDK because they are made with care and quality, and BUDK gets them out to ya FAST! 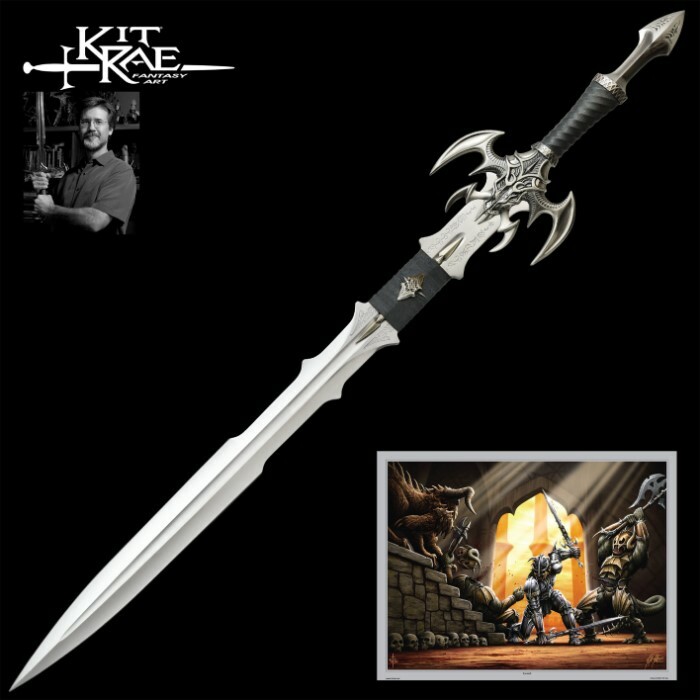 I am going to order all my knives and swords from here! Great job Kit, another beautiful sword as always. you never disappoint! What can be said about this blade that hasn't been mentioned in prior reviews? The entire piece is nicely weighted: as an experienced swordsman, I can vouch for its ability to do exactly what you tell it to. If you ever were to use it, that is: personally I'll leave mine on display, this is an extraordinarily beautiful sword. The runes near the base of the blade are nicely etched, and lend a nice fantasy feel to the weapon. Overall, I'd say this was a well-spent hundred dollars: it's easily the centerpiece of my collection. Came in great condition and is gorgeous. Not sharpened though. O M F G!!!!!!!!!!!!!!!!!!!!!!!!!!!!!11111111ONE!!!11111ONE111!!!!!!!!!!! BUY IT NAAOOWWWWWW!1 *nods head* WORTH EVERY PENNY1!!!!!!! BUT..... the only downside is NOTHING!!!!!!!!!!!!!!!!!!!!!!!!!!!!!!!!!!!!!!!!!!!!!!!!!!!!!!!!!!!!!!!!!!!!!!!!!!!!!!!!!!!!!!!!!!!!!!!!!!!!!!!!!!!!!!!!!!!!!!!!!!!!!!!!!!!!!!!!!!!!!!!!!!!!!!!!!!!!!!!!!!!!!!11ONE111!!!! Rack up another great work for Kit. Actually, he has taken it to a new level. Two thumbs waaaay up!